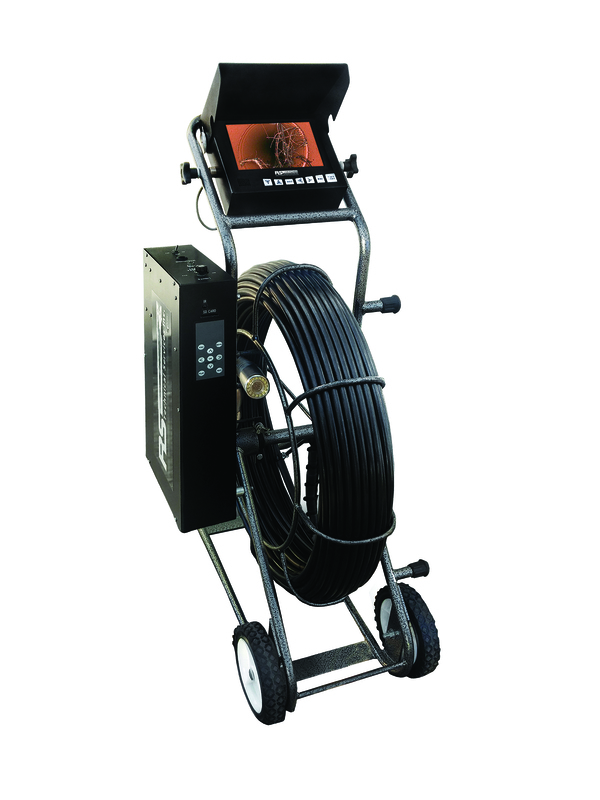 Our all-in-one, fully portable Quick Peek Drainline Inspection System is a compact, lightweight solution for drainline condition assessment. The seven-inch, bright LCD monitor, conveniently located on the handle, can easily be positioned to a comfortable viewing angle for the operator and is equipped with an adjustable sun shield/screen protector. Easily accessible monitor controls include power mode, aspect ratio (screen size) and menu, plus set buttons for color, brightness, contrast, tint and volume. The side-mounted AC/DC power source houses controls for all camera functions and provides a camera test terminal, AC/DC input, video/audio output, keyboard input and a condenser microphone with on/off switch. Inspect 2-10 inch diameter lines up to 300 feet in length. Fully locatable with 512Hz in-line transmitter. LCD monitor (7 inch) with protective sun shield. 512Hz receiver with depth readout (also available in Deluxe Version). Battery pack (on board or external). Roller skid for 6, 8 and 10-foot straight runs.